Mawnin' Loverlies! I have finally received my first book to review from Family Christian! I was so excited about this book, it is called Esther: Royal Beauty by Angela Hunt. This book is a little bit of a dramatization of the story about Esther in the Bible. At the end of this book the author explains how she tried to keep the story as accurate it is in the Bible. This is the first e-book I have every fully read and wrote a book review on. I do enjoy books I hold better, because I love the feel of them in my hands and they don't hurt my eyes to read them. I will say, it was easy for me to read because of how interesting it was. I enjoyed this book immensely, and now have found a favorite story of the Bible. 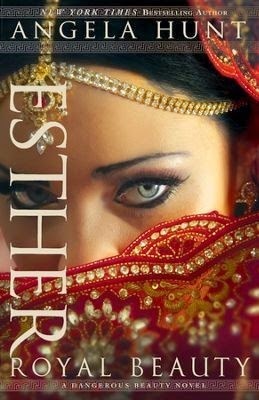 Sadly I have never fully read the story of Esther before, but I have found it is a story of adventure and suspense. It is also a great story for teaching us how to have faith and patience within the Lord. Esther was a very brave woman, and great example for how we should fight our trials. I very much recommend this book for everyone to read. I also suggest, if you decided to read this book, that you read the story of Esther in the KJV bible. I decided to read it from the Bible myself, and also have watched the movie. I was so lucky to have found the movie Esther on Netflix to watch! I do wish they would redo the movie as how this book is written, it is a bit different of course, then how Hunt wrote her book. Again I say, give this book a read because it is wonderful! If you want to give this book a try HERE is a link where you can purchase it. Have a Blessed Day! If you do not own a Bible you can read from the book of Esther in KJV here. Esther marks bestselling author Angela Hunt's return to biblical fiction. In each novel she explores an example of a Hebrew Old Testament tob woman: a woman whose physical beauty influences those around her--and can change the course of history.